Little House of Science makesscience fun and exciting for Little Scientists (4-7 years) and Big Scientists (8-11 years) and help contribute to their understanding of how nature and the world around them works. Given children’s in-born curiosity and enthusiasm towards learning new things, we want to create an environment where they can have fun, experiment and learn facts which can help them dissect our world! We at Little House of Science foster this curiosity and re-enforce STEM related subject in a fun and practical way so that the children can connect with science from an early age. All our science instructors have either Master or PhD degrees from renown UK Universities, having studied Zoology, Physics, Chemistry, Biochemistry and Mathematics, as well Science Communications. Our teachers love working with children and passing their passion to study Sciences. They are fully DBS checked, insured to teach in schools and nurseries and any open venues and have ongoing safeguarding training. 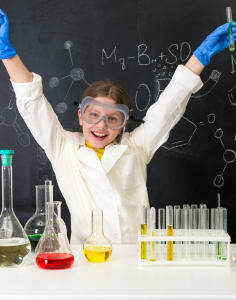 Anatomy of lessons Each project based science lesson introduces children to a new scientific concept or idea in a simplified and an age-adjusted way. The starting point of each workshop is a presentation and a group discussion of the scientific subject combined often by a video material and supported by a practical demonstration.The second part of the workshop is dedicated to practical work where children have the opportunity to explore the topic of the day by performing hands-on experiments. During our workshops, children are encouraged to ask questions, perform investigations, get familiar with the “scientific” vocabulary and ultimately learn to apply problem-solving skills. Our materials are thoughtfully designed to include colourful notes for the children as well as supportive notes for the parents to keep them informed on what the children learned at each workshop.